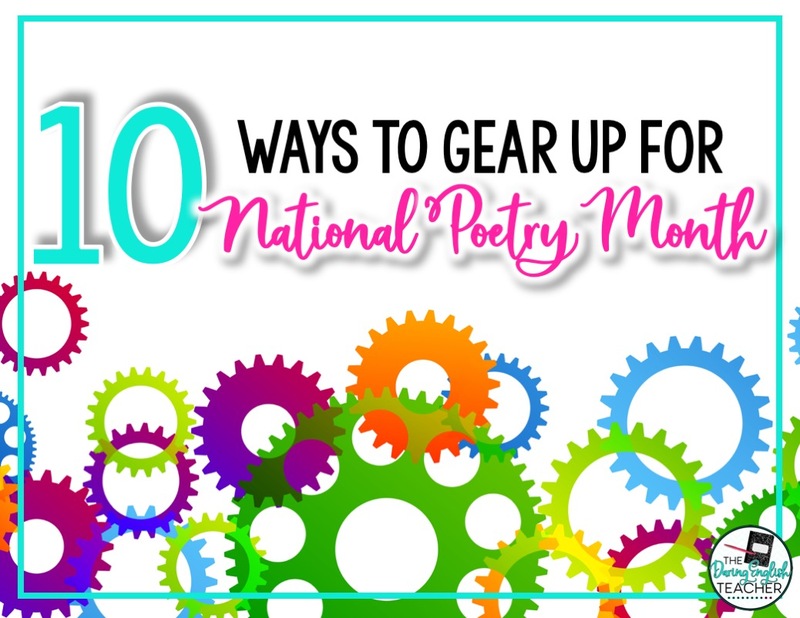 April is National Poetry Month, and while it is essential to add in poetry throughout the entire school year, teachers usually place more emphasis on poetry during this Spring month. Here is a look at how I am getting ready to focus on poetry in my classroom. 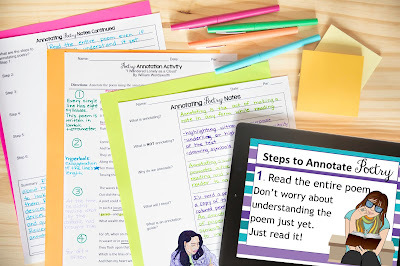 One of the first lessons I teach my students is my Annotating Poetry Made Easy lesson. 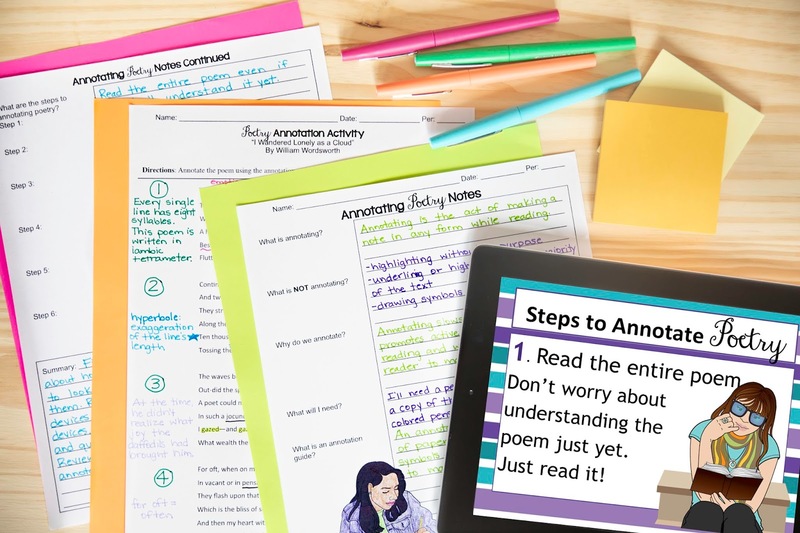 This mini-unit helps students learn how to read poetry and begins to help students establish a format for annotating poetry for analysis. 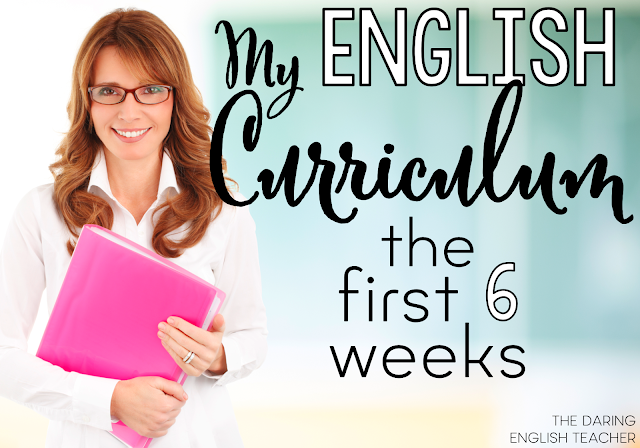 In this mini unit, I use William Wordsworth’s poem I Wandered Lonely as a Cloud, and I include step-by-step annotating instruction that you can complete as a class. I always find it beneficial to annotate with students so that they can learn how to do it and increase their confidence in their annotating abilities. 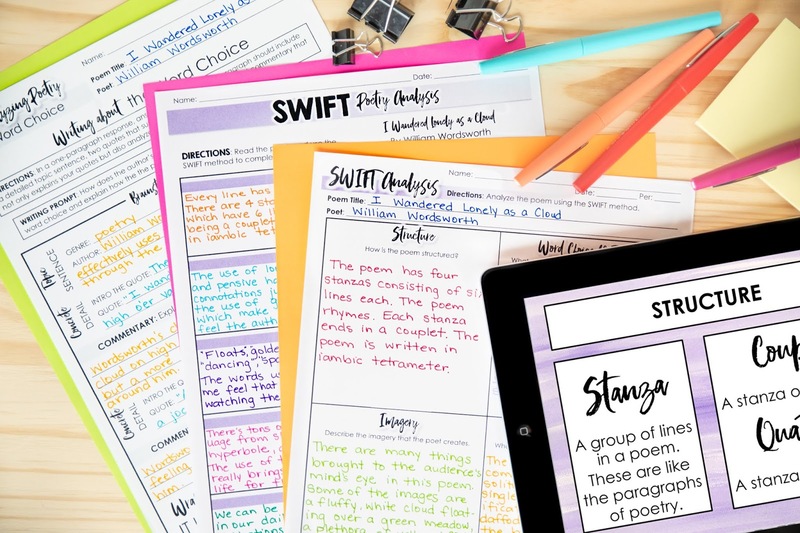 Once my students have a solid foundation about how to read and annotate poetry, I then move on to teaching my students about poetry analysis with my Poetry Analysis with Sticky Notes unit. For this, I use the acronym SWIFT: structure (can also be replaced by symbolism), word choice, imagery, figurative language, and theme and tone. With structure, I also include poetic sound devices. This unit is always fun and engaging because students use sticky notes to help them develop their analysis. After students have a working understanding of poetry analysis, I like assigning them a collaborative poetry analysis poster. For this project, I recommend selecting poems with similar themes and motifs. I think it is beneficial to assign collaborative poetry projects like this one because students discuss the analysis process out loud, which has benefits for both the strong and the struggling students. Furthermore, quick projects like this allow for group presentations. You can read more about my Collaborative Poetry Analysis Poster project in this blog post. My Poetry Analysis Task Cards include two different task card sets: pre-reading and in-depth analysis. These task cards are a great way to get students thinking about and analyzing poems. 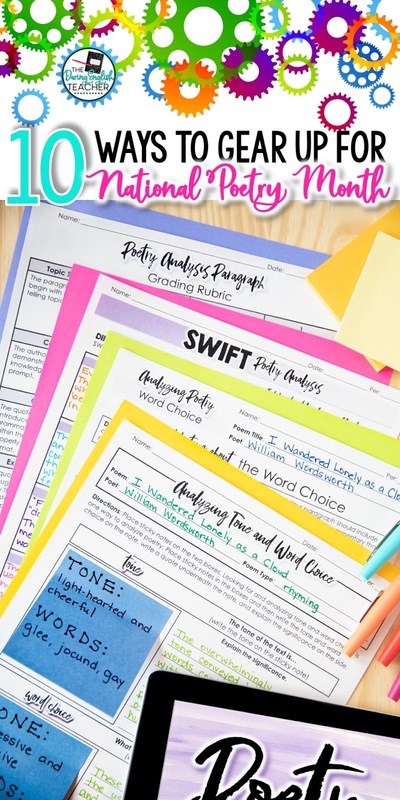 These task cards build off of the SWIFT acronym, and you can also incorporate them in fun and engaging classroom lessons. For example, task cards are great for station activities and group activities. 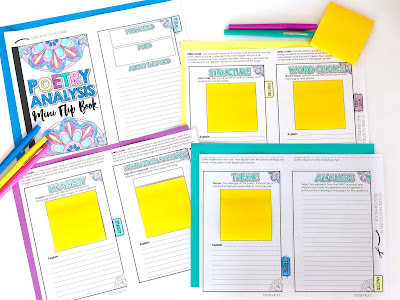 I love this poetry analysis mini flip book because it works with any poem, it incorporates hands-on sticky note analysis, and it also is a great culminating project! For the mini flip book, I like having students choose their poem (usually from a list of pre-selected poems and completing the analysis. I usually assign this blank verse poetry project before my students read The Tragedy of Romeo and Juliet. 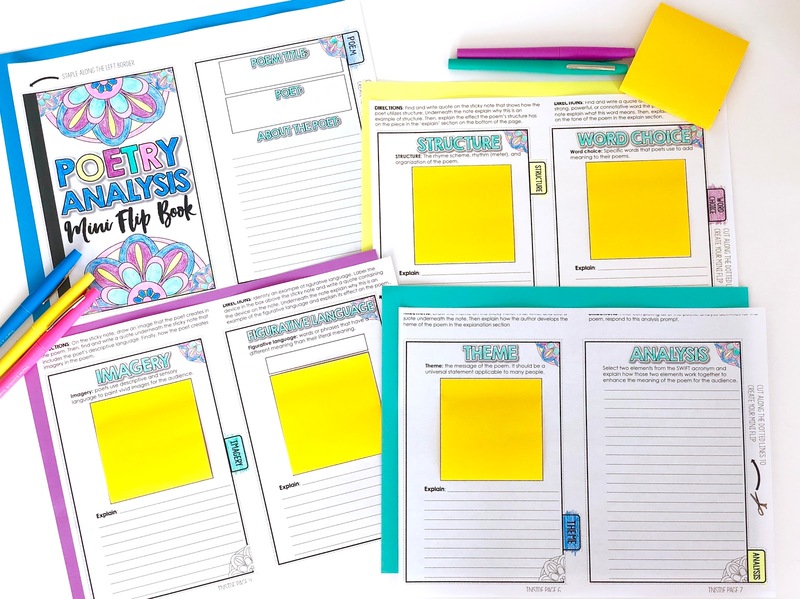 This project is a free download in my store, and it encourages students to write 4-6 lines in blank verse about any topic of their choice. For this project, I order (Amazon affiliate link) 18x24 inch construction paper, and then have my students illustrate the top half with their topic and use the bottom portion of the paper for their lines of blank verse. This project is great because you can use the final products to help decorate your classroom. I love incorporating blackout poetry into my poetry unit because it forces students to exercise creativity and critical thinking. Integrating a blackout poetry assignment into any literature unit is easy. To do so, print out pages of text from your current novel study, and have students complete their blackout poetry assignment from there. You can read more about blackout poetry in this blog post. Also, a blackout poetry rubric is one of my 15 free email downloads. You can sign up to receive those 15 emails here. One way to help students understand poetry is to help them become more familiar with poetry-specific vocabulary. My Academic Vocabulary: Words about Poetry does just that! A fun way to kick-off National Poetry Month is to assign your students a Poetry Group Research Project. For the project, students work together in groups of 3 to 4, and they research a famous poet. I usually dedicate a couple of days to the research portion of this assignment, and then the student groups present their findings. This is an excellent way for students to learn more about famous poets. 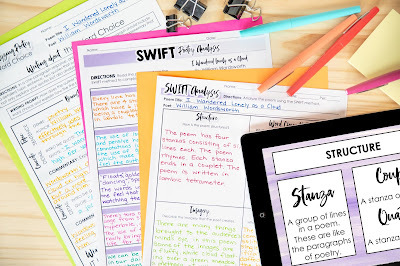 Another fun poetry project to assign to your students during National Poetry Month is a universal theme poetry project. This is a free download available in my store, and it’s a fun and creative way for students to analyze universal themes found within poems. You can read more about this project in this blog post.